With all the lead up of getting organised for my open day I forgot to share with you the card class samples we did! 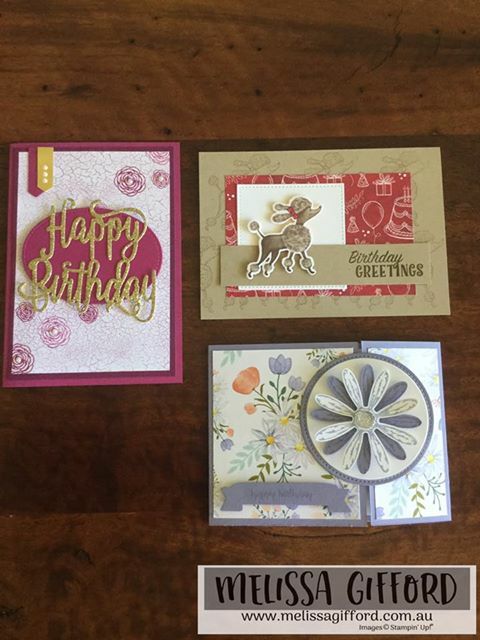 I was asked if we could make some birthday cards so instead of the usual 2 cards and a 3d project we made three cards. I had a hard time choosing which three cards to make though as there is so much to choose from in the new catalogue! In the end I just went with a bit of everything! Lots of new stamps, punches, designer series papers, dies and bling! And of course my all time favourite dies - the stitched shape framelits. I seem to be using these on almost every project I make lately. I just leave them out on my desk now as they are constantly in use. I used pinterest as my starting point as at this time of the year there is sooo much inspiration for all the new products. These cards were based on ones I found there. Isn't that Poodle just the cutest? It is cut out of the designer series paper using the matching dies. Quick and simple. 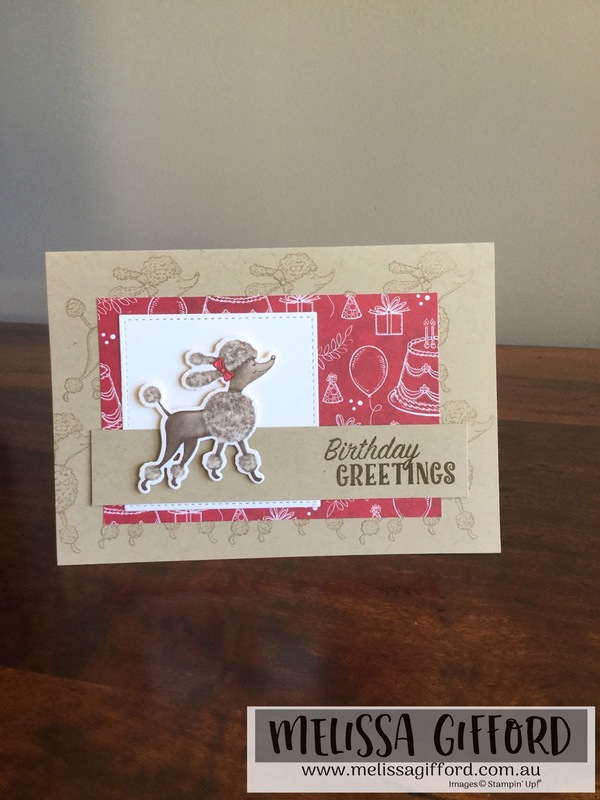 We used the actual poodle stamp on the background in crumb cake just to give the card a bit more of a lift. For this card we used the Happy Birthday Framelits. The awesome adhesive sheets are back making these intricate dies much easier to stick to your projects. 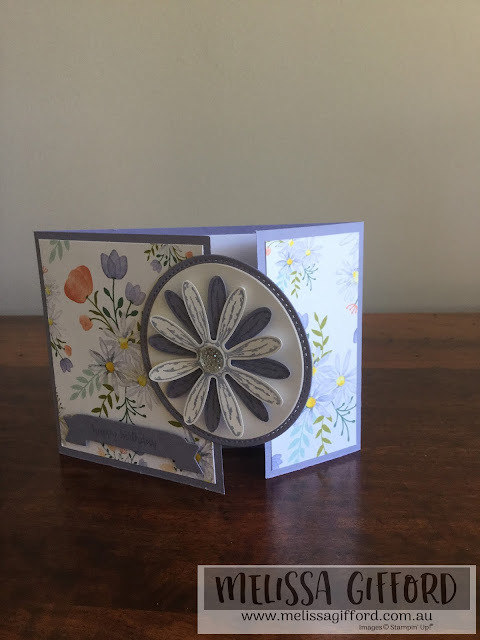 We used the small flowers from the Happy Birthday Gorgeous stamp set and stamped directly onto the Colour Theory designer series paper. I love the crackle look. A couple of pearls and a bit more gold and we were done! This style of card is called a Gate Fold. It is still a half sheet of A4 just cut and folded differently for a bit of interest. The daisy circle folds it flat. Isn't that paper stunning? And the punch is still out of stock unfortunately. It's been a huge seller! 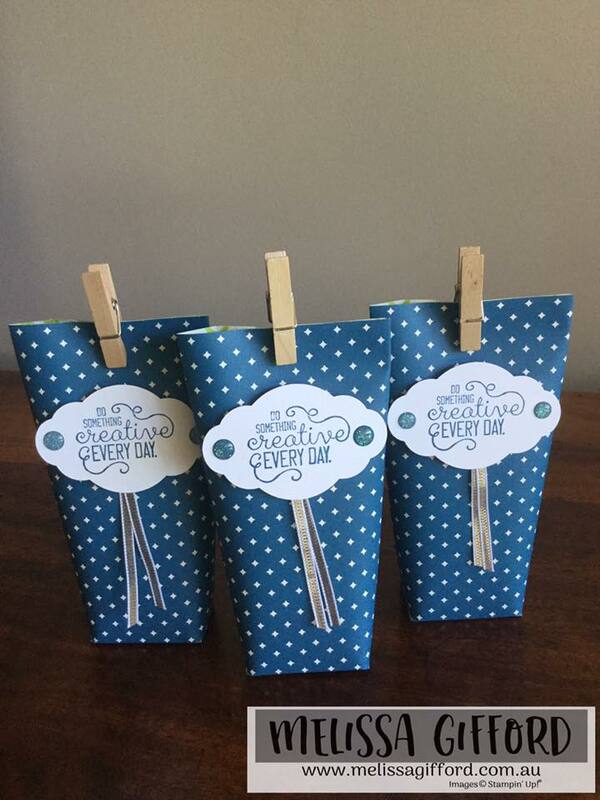 The little blue pouches were some of the table favours I made. Each one had a large freddo frog chocolate inside! I decided to use some retired wooden pegs as I knew ribbon tied in a beautiful little bow would just slow down the chocolate retrieval too much for the girls!! I had planned to use the gold binder clips but realised too late that I didn't have enough! I got this idea from Crafty Caroline Creates, she makes some beautiful little boxes and packaging. And did you notice the punched out shape and the gorgeous glitter enamel dots? Yep, they are new too. The sentiment comes from the set Crafting Forever.